There are many types of pool cover but the most common are the winter cover and slatted covers that roll up at the touch of a button. No matter what type is on your pool, there are some common steps that should be followed to carry out the cleaning procedure safely and without damaging the cover. Cleaning your pool cover is a very important task that should be given priority especially at the start of the season when the cover will have been in place for many months over winter and will have suffered a build-up of debris and other contaminants. These cause deterioration of the fabric of winter covers and build up in the cracks between the slats of the slatted type of cover. Careful removal and cleaning will prolong its life and lift its appearance. After all, nobody wants a tatty cover on a lovely pool. A winter cover will very likely have accumulated quite a lot of loose debris and possibly some water depending on the type of winter cover, these must be removed first before attempting to remove the cover. Using a long handled pool pole and pool brush , sweep the loose debris into piles at the edges and carefully remove it. Carefully clear away the water from on top of the cover, as you do not want it to fall in to a cold pool! If you do have water on the cover the best approach is to use a cover pump and there are devices available on the market for this very purpose. Alternatively, call in the specialists who will do it all for you. For slatted covers, endeavour to brush as much dirt and debris as possible from the cracks between the slats, dragging it carefully to the edges but not so far as to fall into the pool. A slow and steady patient approach pays dividends, so be sure to allocate sufficient time to the task and do not be tempted to rush it. With winter covers carefully remove the cover and place it on a flat area, usually the adjacent lawn. Unfold it and lay it flat out ready for cleaning. Hose it down and then clean it with a mild household detergent. If mould has developed, wipe it off with a mild bleach solution. Then hose down the cover again to remove all detergent and bleach. Allow it to dry and turn it over so that the underside also dries. Then check for any rips or tears and repair them with a patch repair kit. Once it is completely dry roll it up carefully and suspend it from the ceiling in the garage or a shed. Do not leave it lying on its side on the ground. We are experienced in all aspects of pool maintenance, including cleaning and treating covers. 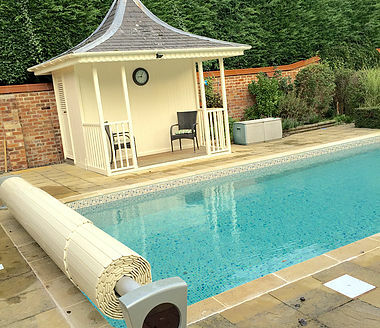 Consider making an appointment for us come and, not only remove and clean your cover, but also check over the pool and all the fittings, such as the pump and pipework. If any damage has occurred over winter, now is the time to attend to it to ensure you have a long and enjoyable pool season. Call us on 01536 646 007 to make an appointment.